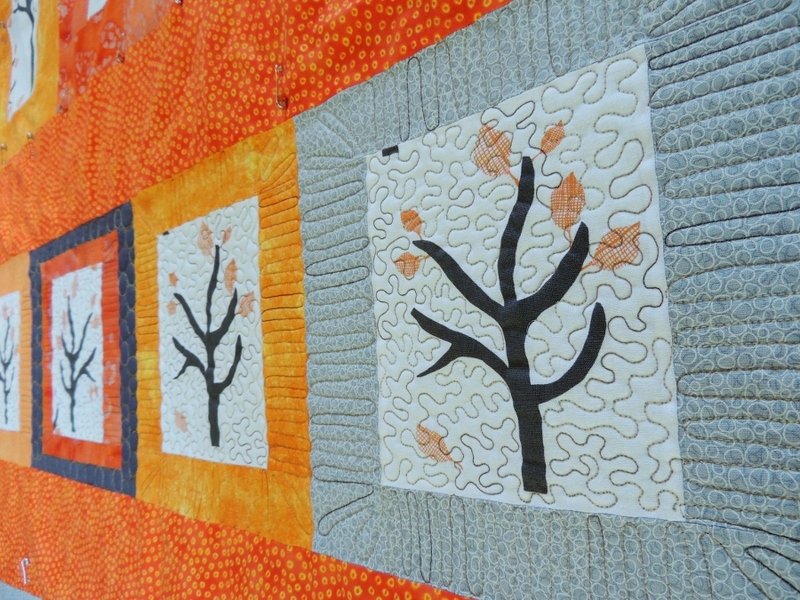 I really loved how the quilt top for Namibia Trees turned out, and I wanted to spend more time thinking about the quilting than I normally do. 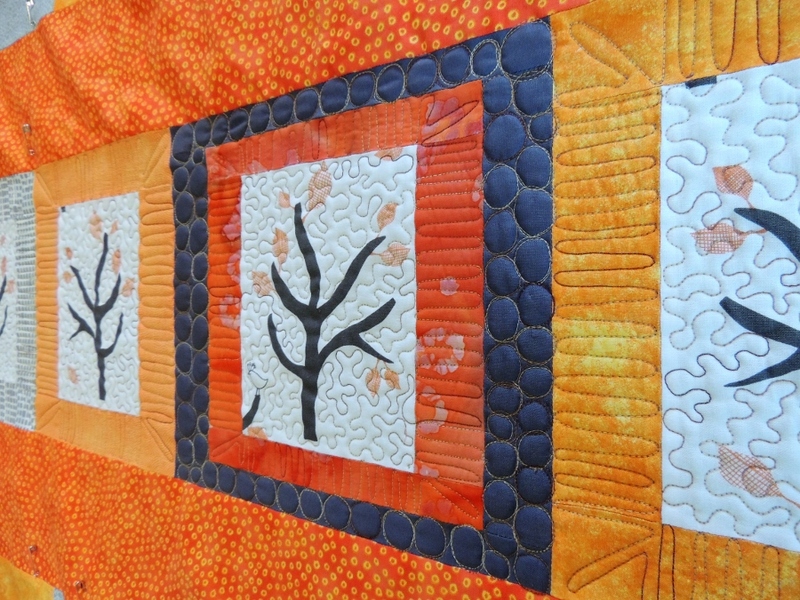 Instead of an all-over quilting design, I wanted to do something a bit more around the tree panels themselves. I have never really quilted a meandering, rounded, stipple pattern, so why not start by doing tiny stippling on a quilt that you really want to love (*eek, no pressure*)?!?!? Well, it seemed like the right thing to do, so before I could second guess myself, I jumped right in. Because this is a larger quilt (roughly 57 inches square), I started quilting in the middle and worked my way out to keep the backing as flat and un-puckered as possible. Which meant I was quilting the middle focal block at the beginning, yikes! 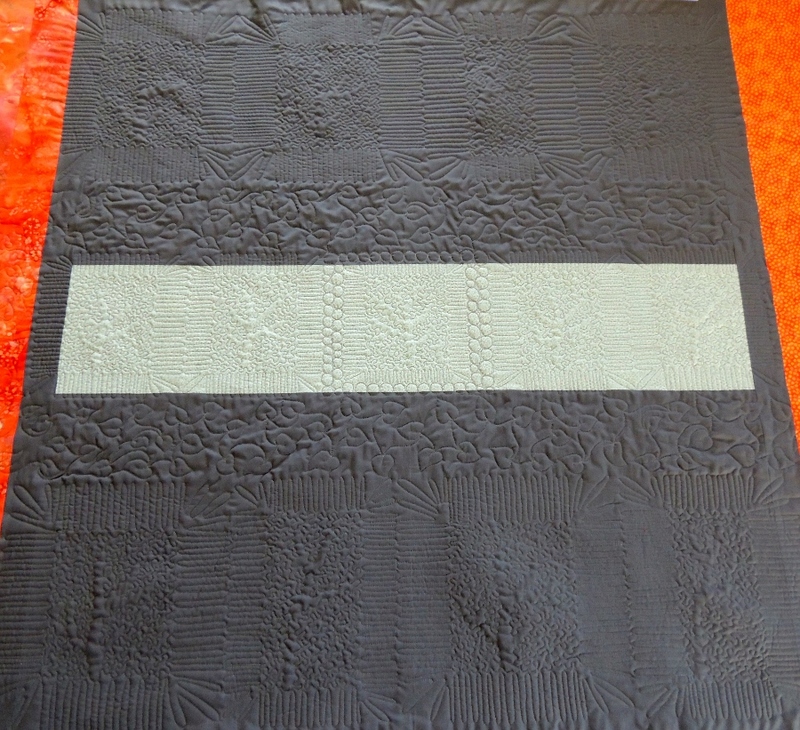 I wanted to change the quilting pattern up for the borders around the tree blocks, and I changed the quilting again for the extra border around the focal / middle block. I did not really give myself time to stop and think too much as I did the first row of quilting. When I finished the row and pulled it off the machine to look at and photograph, I was really excited and happy with how it was looking! Next, I added quilting detail into the borders around the center row of blocks. I chose to use the meandering leaf / vine pattern that I practiced this weekend and featured in Part II of my Free Motion Quilting Tutorial. 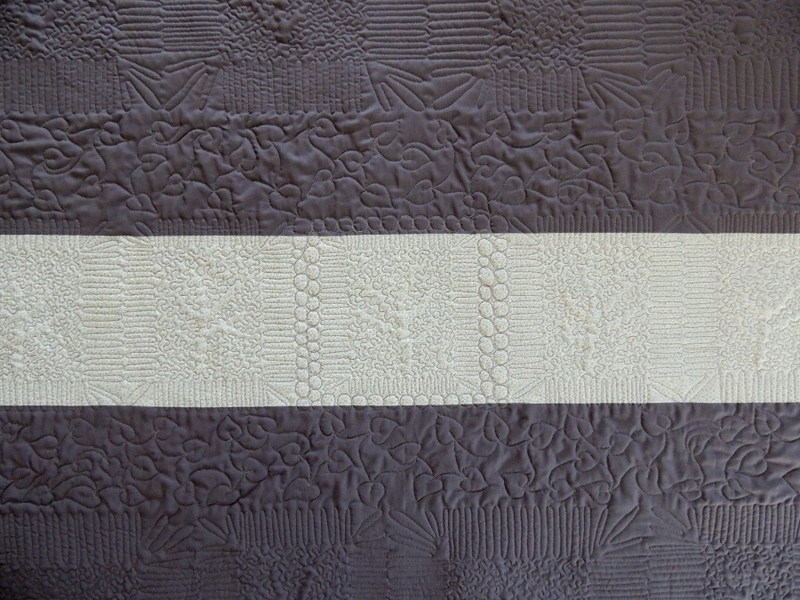 I then added quilting detail to the remaining blocks before finishing up the meandering leaf / vine. I am really loving how this quilt is coming together, and seeing the quilting pop on the backing is really rewarding. Today I am going to work on putting on the binding. I think I will be entering this quilt into my local fair (the deadline for registration is July 12th, so I don’t have too long to make up my mind for that). Your quilting is fantastic! I like quilts that change it up for different components, and yours is a great example. Did you have to start and stop a lot though? It turned out great! I love all the different textures the quilting added. It is looking great. Love the texture and colors. Yes, enter the quilt in the fair! 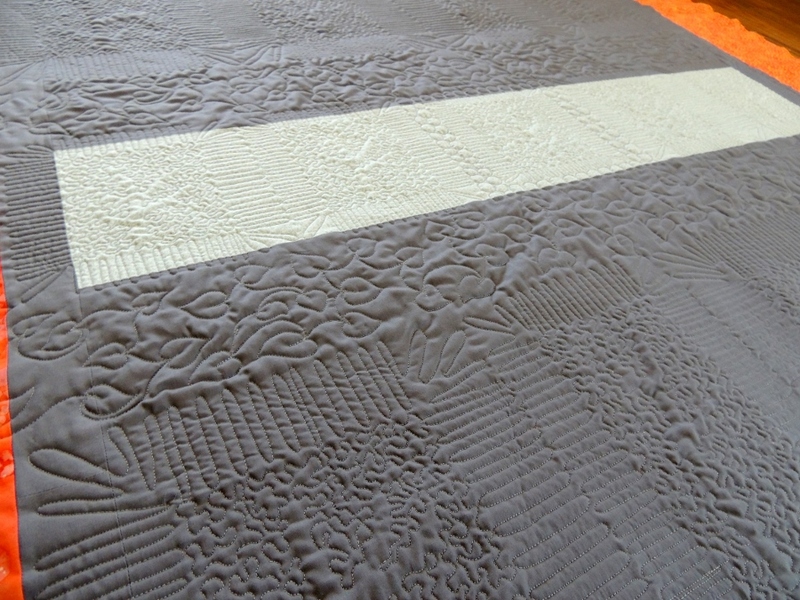 I love the texture and visual interest that the quilted added to an already awesome quilt. Nicely done. Oh I love the quilting on that. Glad you went with your first instinct! This is fantastic. What a beautiful quilt and what excellent FMQing on it. I really love the leafy pattern, perfect choice for a quilt of trees! 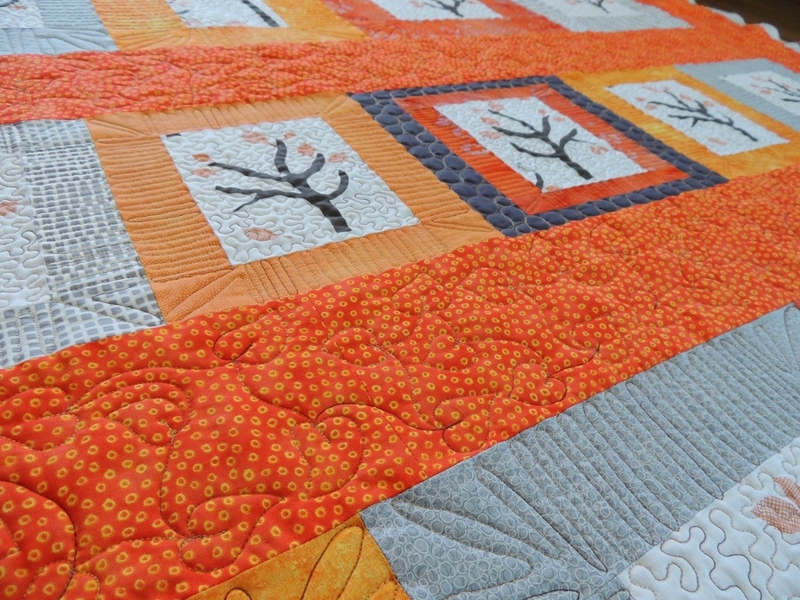 Love those trees, love the orange, and the quilting is impressive.